I was given the opportunity to select a product from Big Green Smile to review. It’s a website that I have not used myself but I am aware that it exists. The site stocks a wide variety of natural products ranging from personal care to household cleaners. Something which I can not recall seeing on other sites is the ability to search by Certifications such as Allergy UK Seal of Approval, Fairtrade and Vegan Society Approved. I chose to review Dr Bronner’s Organic Lavender Shaving Gel. I picked this because I love Dr Bronner’s products and have used them for many years. I cannot be without the liquid soaps. For anyone not familiar with the brand, products are completely free from synthetic ingredients, fair trade and certified organic. I have found that the gel needs to be worked into damp skin in order to create a nice creamy lather. It does require a bit of effort to create a good creamy layer. I do think it works better for me than the Bulldog Shaving Cream I reviewed last year. The scent is subtle lavender nothing offensive or overpowering but none the less soothing as you’d expect. I asked my boyfriend to help test the shaving gel since it is unisex. He doesn’t use natural products so he commented to the lack of lather. As we know that is due to Dr Bronner’s not containing sulphates. I had to encourage him to experiment with the amount of gel he was using. His first attempt resulted in a rather sore looking face which I think could be a direct result of not using the correct quantity. He tells me the next time he used more gel and the results were better. This was also visible to me. I like the shaving gel for my legs as I haven’t suffered any irritation. I do think it leaves my skin in a nice condition and I’m not noticing immediate dryness (I do always finish with a body lotion). As for the boyfriend, his face feels nice and smooth but he hesitates about making this a permanent part of his shaving routine. I on the other hand would happily swap with my other shaving gels. This is going to cost you more than the supermarket equivalent, £6.99 for 208ml but remember it does not contain PEG’s, parabens or propylene glycol. If lavender is not your favourite scent then the shaving gel is also available in lemongrass lime, spearmint peppermint, tea tree and unscented. 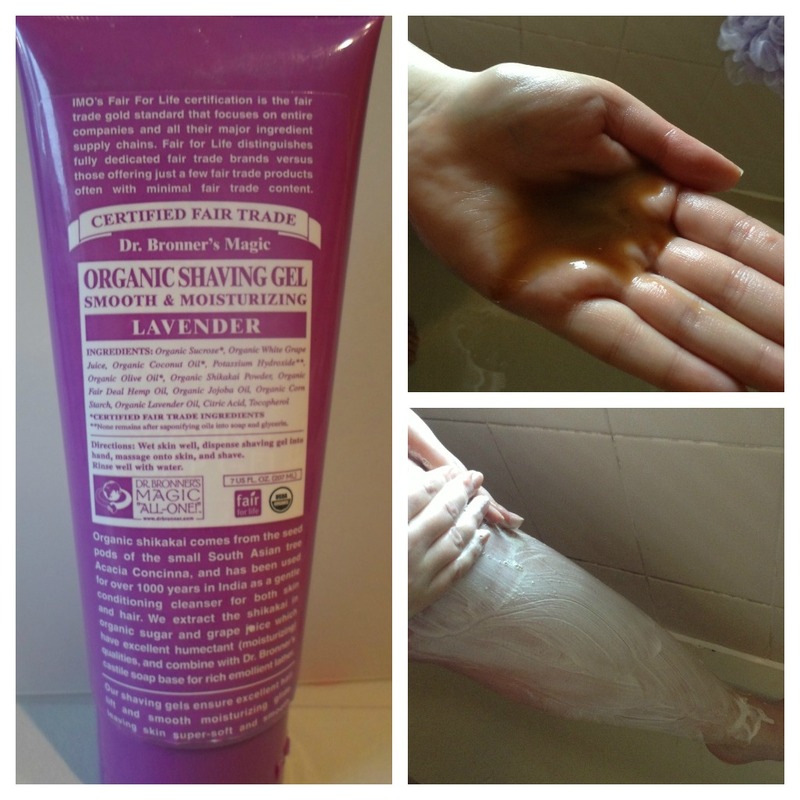 Have you purchased from Big Green Smile or tried Dr Bronner's products? Let me know what you think in the comment section below. Oh my gosh, this is EXACTLY what I need to get for my spouse. I'm tired of seeing him purchase chemical ridden creams but haven't found him just the right thing yet. I didn't know Dr. Bronner's made a shaving soap! I'm not really a fan of shaving products that don't lather well, natural or otherwise. I have quite sensitive skin so need that extra cushioning from a thick creamy lather. I think I have some samples of the liquid soap you mentioned, I had 4 sachets with another order I place. I tried a rose one but didn't like it. My skin felt quite dry & tight afterwards. I think they are the same range, I'll double check when I get home. I remember them saying magic 18-in-1 liquid soap although I don't know what the 18 different uses were?? Sounds like you have Dr Bronner samples. I've never figured out 18 uses for the liquid soaps :) I like to use it for hand washing, makeup brushes and laundry liquid when on holiday (for emergency). I know people use it for body & hair wash and brushing teeth! Shame that you find them drying as I don't have that issue. I like the Almond, Peppermint and Baby versions. Not sure whether you would find the lather cushioning enough with this gel, I think that's why my Boyfriend experienced some sensitivity. I didn't know they made shaving gel! I usually use Kiss My Face but think I will give this a go for fun! I like Dr Bronner's magic soaps for cleaning makeup brushes, I just use shower cream/gel for shaving lazy I know! I want to try this! I am such a big Dr. Bronner's fan, hopefully I will get around to trying their hair cream too eventually. Does this smell as strong as the lavender-scented dr. bronner's all-in-one castile soap (not sure whether you've tried that one)?